One of my goal/bucket list for this year is to travel. I've been saying this to myself and even to this blog for so long but it's game time for 2016. 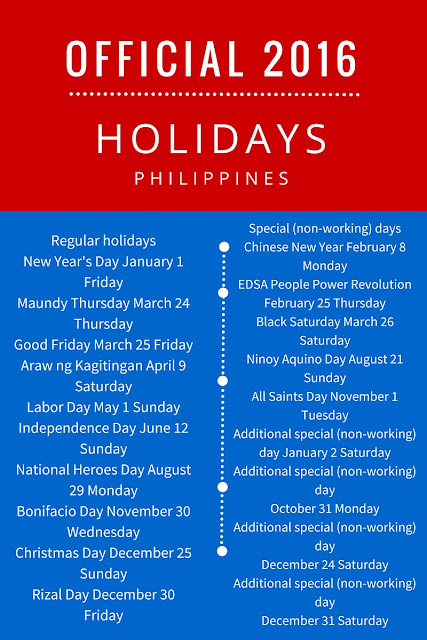 And to help me plan better on how I will tackle each places to visit this year, the release of the legal holidays in the Philippines 2016 will be a great help. After much research I gathered all the dates in one infographic. Please feel free to share and/or download the picture. I hope this could ignite your travel plans. I hope this infographic helps you.